Welcome to our first Guest Blog. This month’s blogger is Hillary! Each month we will feature voices from young people of color on our blog to share their narratives. Many young people have shared with us their stories as they begin to unpack and navigate the ways in which oppression, power, and privilege operate in their lives. This space is to support YPOC through this process and be a place to collectively dig deeper on how we heal from the struggle. We are grateful for each of them for sharing with us this process in building their counter-narratives. My first time travelling alone was just in May when a spurious decision resulted in a grant and a round trip ticket to France. I had spent the first month in an environment where I felt grossly uncomfortable by the more apparent differences between myself and my French host family–not because of something I had fabricated in my head, but because these differences began to shape the discourse of each interaction. My race became a delineating factor between myself and them, as well as my white American roommate. Whereby I thought I would find solace in someone who shared the same nationality as myself, I quickly grew cognizant of just how much our realities seemed to diverge. Each day, I returned from my language school, and at first, I was often greeted at the door, but this would soon change. No longer would I stop to meet my French host mom at the threshold, but rather, I would quickly walk upstairs, failing to remove my shoes, simply hoping that I would go unnoticed. Soon thereafter, I was returning to an empty apartment–and while this brought me some resolve, I was disheartened by the relationship that developed between myself and them. 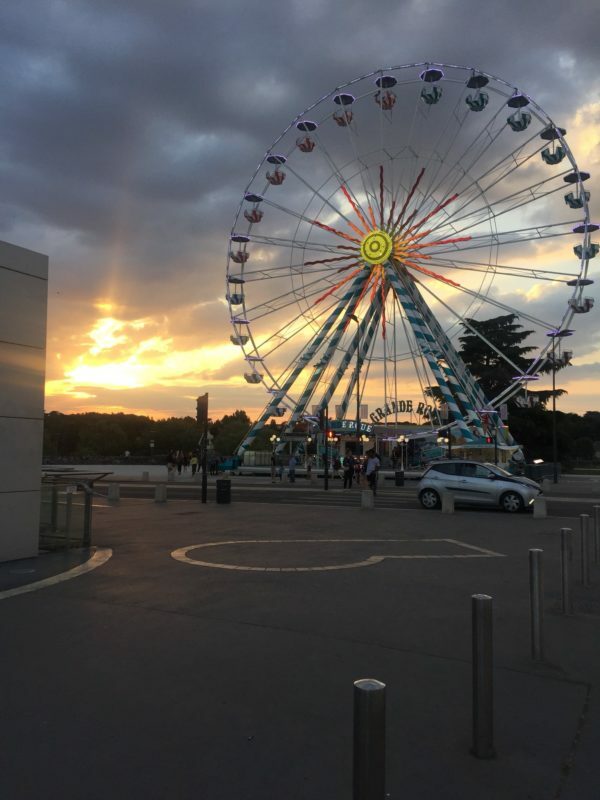 The repetitive breakfasts of croissants, pain au chocolats, and yogurts soon subsided, as I could no longer eat them, and late mornings would simply mean stuffing what I could into my bag in order to promptly arrive at the tram. At school, I was always meeting new people–people from Iran and Switzerland and Spain and the Emirates. But with the consistent emergence of new faces and the cursory introductions, I became fatigued. It was tiring–constantly hoping to fortify a new group of friends to embark on adventures with–when the limitation proved not only to be our nationalities, but our ages as well. Some young and some old, those who became my classmates would only spend time with me before the moon returned to its place in the sky. This was the signal for dinner–just in time for me to find my way back to the main road before taking the tram to reach the stop that announced “Tranche”. –all while I desperately wished to return to the quarters of my room where I would simply lay without the sound of a single voice. I was left to respond with the little French that remained in my repertoire. 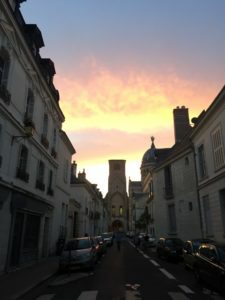 Perhaps my trite responses became misconstrued, but there was this lingering sense of disappointment and disapproval–that I had failed to fully embrace French culture. Little had they known that I suffered from my own qualms of not being able to rid myself not only of this guilty feeling that emanated from feeling ungrateful for the opportunity that I had been gifted with, but this feeling of loneliness and discomfort. The little bits of satisfaction and appeasement that I felt once smelling the aroma of chicken and potatoes or another familiar dish became moments of anguish when met with the peculiarities of French cuisine. I hated carrot salads and quiche, or the small plates of deli meat that my host mother would leave behind as our entrees. Although attempting to remain open-minded with my awareness of the profound differences between my cultures and theirs, the cultural exchange grew burdensome. Sometimes, I simply longed for something homemade–whether it was American, like a pizza without the addition of salmon as a topping, or the customary Nigerian foods prepared by my mother like Egusi soup and jollof rice. There was some initial embracing of my culture–when I emerged from my room with a headwrap on or days in which I adorned my afro. I was met with surprised faces. “Tres jolie!”, my host mother would retort. Although she found it beautiful, I hated the patting of hands on my hair, as if I was a dog. In many instances, I suffered with my own sense of cognitive dissonance, but I presumed that the only solution that seemed viable was to create my own areas of safe spaces. I would sometimes ask to eat dinner alone, as a means of gathering my thoughts and preventing myself from crying in front of strangers who had very little empathy for my situation–often met by strong condemnation. My proposals for solitude were ignored and my participation was deemed necessary–as I was required to act in accordance with the rules mandated by my language school. Yet, my broken French was another hindrance. In turn, I would repeatedly meet with the woman who had given us our family placements–hoping to find myself under the auspices of someone new. But as I awaited the change, my broken French would lead me to befriend and interview the Cameroonian family that owned the restaurant just two blocks down from my apartment, learning about what it was that prompted them to move from Central Africa to France. And just blocks from my school, I would consistently revisit the same route to greet the Congolese woman whose restaurant was nearby, along with the group of men and women from Gabon who consistently sat outside the shop’s windows. Yet, my problems persisted. In recalling the evening of “Fete de la Musique”–the day of music meant to commemorate the summer solstice, there had been a mutual understanding that my arrival would be delayed by the evening’s events, but as I arrived sooner than anticipated with tupperware filled with chicken and plantains, hoping to appease my afflictions, the arguing began. Asking to eat in a separate room rather than my room upstairs where the smell would occupy the linens, I was being forced to plead with the very people who had come to dislike me. “Don’t make a mess. I am tired. I am tired of cleaning up after you”, she remarked. However, never had I left a mess. Suddenly, she was curious, making her way towards the contents of my container. “We’ve never had to deal with someone like you before. You are the first person to give us trouble”. I knew what this meant–that the phrase “someone like you” was someone black. Her husband’s passive aggressive nature and her insistent scoldings reasserted the notion that there only remained one understanding of the African American woman– too opinionated and too problematic, never subservient and always expecting too much. I was saying too much, even when I said too little. In the month that I spent living with them, my expressions were often indicative of my contempt–suggestive of the fact that I never wanted to discuss politics, nor do the same things that my roommate did, or force-feed myself the things I disliked, thereby evoking feelings of estrangement. For them, they were exploiting my position as a guest within their abode–being treated as a child and never afforded the opportunity to say “I do not like this” without being misunderstood as overly critical. My roommate, however, was the perfect anathema to my existence. She preoccupied herself with those from school whom she had known for months prior, and fell into the good graces of our host parents with her vivacious spirit. So while she was not eager to depart from France, I awaited my return to the United States. After returning to the US, it was not long before I embarked on a journey elsewhere–this time to Israel and Palestine. Meet the Author: My name is Hillary and I grew up in Dallas, Texas. I am currently a junior in college, studying both Neuroscience and Political Science. I wanted to share my story because I realized that the very things I feared before embarking on this journey had come to fruition, and it was the documentation of my experiences and emotions throughout my time that allowed for me to rationalize and accept the events that had transpired. Somewhere throughout my time in France, I realized that my fear of constantly experiencing microaggresions and racism within a new context was an obvious hinderance, but one that was truly manifesting itself and preventing me from engaging with others. I needed to reflect upon this experience, because it was necessary for me to be honest. I didn’t tell many people about my experience once I returned to the United States as I grappled with anger and a bit of sadness, but I knew that it was just as necessary to portray how difficult it was for me to navigate that space as it was to showcase the importance of remaining resilient, while also being cognizant of the interactions that were taking place before me.